I never would have thought that I’d ever quote Wayne Dyer. But one sweet summer morning in the garden made me a fan of abundance, cheer, and positive thinking. Searching the internet for an appropriate quote for this column yielded Mr. Dyer’s remark. (see “Words from Others” at the end of this post) I’m pretty sure he was talking about gardeners. We have an abundance of gifts: flowers, fruit, and cheer. Foreground: decorative gourds that volunteered from our brush pile (I did think the vines were dead! 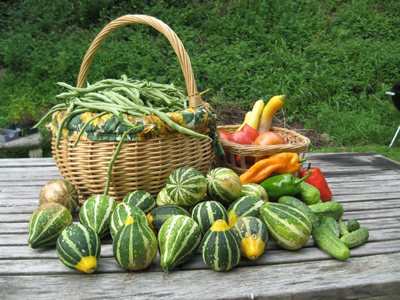 ), plus cukes, tomatoes, squash, peppers, and yes, that ENTIRE basket is filled with green beans! I gifted our two neighbors with heavy sacks of green beans, and then turned to the kitchen, to blanche and freeze the rest. I ended with 8 quart bags filled with delicious beans, and the vines are still producing heavily. fresh green beans – any quantity. I figure one handful per serving. version is heavier and protects better against freezer burn. Step 1 – Get yer green beans! Start with fresh green beans – as fresh as you can get. If there is a delay between harvesting and freezing, put it in the refrigerator or put ice on it. Step 2 – Wash the green beans! I’m sure you can figure out how to rinse the green beans in plain cold or lukewarm water. Just take a sharp knife and cut off both ends (about 1/4 of an inch, or half the width of an average woman’s little finger). Then cut them into pieces the size you prefer, usually about 1 inch long. Of course, if your prefer French cut green beans, you can cut the beans lengthwise instead, or you can use a “bean Frencher.” (No, that does not make the beans want to wear a beret, or “mime,; it’s just the name.) The Frencher enables you to prepare a huge quantity of beans quickly! Step 5 – Blanch the green beans. After vegetables are blanched, cool them quickly to prevent overcooking. Plunge the green beans into a large quantity of ice-cold water. (I keep adding more ice to it.) A good rule of thumb: Cool for the same amount of time as the blanch step. For instance, if you blanch sweet green beans for 7 minutes, then cool in ice water for 7 minutes. Drain thoroughly. I love the FoodSavers with their vacuum sealing! I am not paid by them, but these things really work. If you don’t have one, resealable freezer bags work, too, but it is hard to get as much air out of the bags. Remove the air to prevent drying and freezer burn. TIP: If you don’t own a vacuum food sealer to freeze foods, place food in a resealable bag (e.g., Ziploc, Glad), zip the top shut but leave enough space to insert the tip of a soda straw. When straw is in place, remove air by sucking the air out. To remove straw, press straw closed where inserted and finish pressing the bag closed as you remove straw. It works fairly well, but I’ll stick to the Foodsaver, since the bags are microwaveable and much thicker than a resealable freezer bag. I did something a bit different when I did my own freezing: I separated the beans by size, reasoning that fat older beans would take longer to cook. And, good news (still under Mr. Dyer’s influence, I guess! ): the beans that seemed too old to bother with cooked up beautifully with those few extra minutes in the pot. Nothing beats a fresh bean, even if that bean is a little too old for the sniffy snobs. I put the older beans into the boiling pot, waited for the pot to return to the boil, and then cooked them for 6 minutes. The younger thinner beans cooked for 3 minutes only after returning to the boil. I also found a recipe that I found intriguing because it includes mustard. Something I would never have thought to try! Try it I will, and I will report my results. I would love to invite readers to share their favorite green bean recipes, and tell me if they tried the one below, and what they thought of it. I will share their shared recipes! 1 Cook the green beans in a large pot of boiling salted water until just crisp-tender, about 5 minutes. Drain the beans and transfer them to a large bowl of ice water, cooling them completely. (The ice water will shock the beans into a vibrant green color.) Drain the beans well. At this point you can make the beans a day ahead and store in refrigerator. I love beans frozen and I’ll give credit to the directions–they are thorough! I separate my bigger beans and use them for stews–works well because they can usually use a good long cooking time. I love the definition of 1/4″….”about half the width of a woman’s finger.” Gee whiz. Sounded a bit Hannibal Lechter’ish to me, but that is why I left the text unedited. I couldn’t have come up with that if I’d tried. Great idea for saving the bruiser beans for stews. Makes sense to me!